The release of HD video from the new Canon 5D Mk11 hits the web this week and we discuss the wide ranging ramifications of this camera in a new era for digital imaging. Hosts include Phil Greenwood, Cameron Tandy, and James Bellew. Special guest in the studio is cinema and video geek James Gardiner. 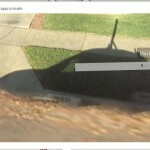 Jim Shryne sends us a picture of the shadow of the Google Street view car. In Australia we see drunks asleep on the footpath on Street view. Vincent Laforet posts a short video showing the making of his short film “Reverie” which is the first film shot with a new Canon 5D Mk11. The posted video in high res via Smug Mug shows what this full frame 35mm sensor can achieve in a visual sense. We have many questions about this camera including, can it shoot HD and 21 MP at the same time? Will Canon allow it to shoot at 24 25 fps? What is the H.264 codec profile specifically? Is the 5D locked to a shoot regime that is usefull? One quote from award winning cinematographer David Parker ( Cascade Films ) which we refrained from including completely explains the high end appeal of the 5D. David points out that the sensor size this camera shoots to is the same as 70mm film stock. RED announce the immediate delay to their Scarlet camera development in light of the release of the Canon 5D Mk11. Adobe announce the release of CS4 and there is some debate to it’s value. USB WIFI for any camera. Video viewer headset for iPod and iPhone. The Microsoft Cray super computer. Hi Phil – could not resist a small observation on the passing comment “who needs a supercomputer”. Just a decade ago a computer that delivered more than a GigaFLOP was definitely into super-computer territory. A decade before that, a MFLOP would do it. I just checked my desktop – it delivers 57GFLOP from the CPU – and nearly 350GFLOP from the GPU for a combined 400GFLOP – nearly 0.2TFLOP. Does it process audio / large graphics filtering & merge / video transcoding fast – yep. Fast enough – nope.